Whiting, Ind. – April 12, 2019 – The Northwest Indiana Oilmen have begun the process of unveiling their roster for the 2019 season by announcing 18 players on Thursday. The club will continue to announce additions to the roster in the weeks leading up to the season. Thompson will help continue the long-standing tradition of Andrean High School graduates playing for the Oilmen this summer. He has appeared in 14 games as a true freshman at Oakland this spring. The left-handed hitting outfielder helped the 59ers to 2015 and 2018 state titles and notched the game-winning hit in the 2018 state championship. He was a 2018 all-state, two-year all-area (2016 & 2017) and three-year all-conference (2016-2018) selection. Thompson also earned a place in the North-South All-Star Game. His impressive prep resume includes the rare feat of hitting two home runs in the same inning. His father Steve played college baseball at Valparaiso University. Another Andrean product, Fushi is a freshman outfielder at Ball State University. A member of the 2018 Post-Tribune All-Area team, Fushi hit .348 with a team-best 11 doubles, two triples, two home runs and 35 RBIs as a high school senior. Continuing the Andrean flavor, Rycerz is also a college freshman and 2018 Andrean alum. He has appeared in 15 games and made nine starts this season. Rycerz had an accomplished prep career that is most remembered for his three-run, two-out double in the bottom of the seventh of the 2017 Class 4A Chesterton Sectional championship game that lifted the 59ers to a 4-3 win over the host Trojans. That was one of the most memorable hits in Northwest Indiana prep baseball in recent years. Ryan is spending his sophomore season at Purdue Northwest after starting his collegiate career by playing at Indiana Wesleyan in 2018. He was a member of an NAIA Regional qualifying team in his lone season with the Wildcats. Ryan owns a .273 average in 16 games with the Pride this year. The left-handed hitting third baseman was named The Northwest Indiana Times Player of the Year in 2017 after setting six season and seven career program records during his time at Hebron. He also won the Post-Tribune Player of the Year Award in 2017 after hitting .557 with 10 homers and 57 RBIs. Ryan finished tied for the state lead in homers and led the state in RBIs. 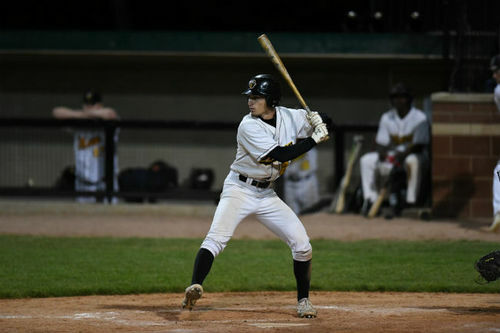 Petkoff returns from the 2018 MCL champion Oilmen after hitting .311 with six doubles, a triple and 18 RBIs a year ago. He is the leading returning player after making an MCL All-Star Game appearance last season. Petkoff provides the Oilmen with a proven left-handed bat for the 2019 season. A left-handed hitting redshirt freshman at UIC, Farrell has played in parts of each of the last two seasons for the Oilmen. He hit .400 in eight games while racking up eight RBIs in a limited sample size with NWI early in the 2018 campaign. Farrell is part of a UIC program that has traditionally been a high-caliber Horizon League club and plays at beautiful Curtis Granderson Stadium. Torres is back for a second season in the Midwest Collegiate League after pitching for the Crestwood Panthers in 2018. He logged 24 innings over six games and made five starts. Torres was a member of the 2018 Post-Tribune All-Area team after serving as the winning pitcher in both regional games for the Chesterton Trojans as a senior in high school. He went 6-0 with a 1.80 ERA and struck out 59 over his final prep season. Also a member of the 2018 Southland Vikings, Napleton posted a .330 batting average and drove in 16 runs while ranking second on the team with 30 hits. A sophomore at St. Leo, Napleton is college teammates with a pair of former Oilmen – Danny Torres and Amir Wright. His college coach is former Saint Joseph’s College (Ind.) coach Rick O’Dette. A current high school senior, Brannigan has signed to continue his baseball career at the University of Notre Dame. He has played shortstop, centerfield and pitcher during his prep tenure. A four-year varsity player, Brannigan was an all-conference performer in 2018 while also being named the ESCC defensive player of the year. The Wheeler High School senior has signed to continue his baseball career at Northern Kentucky next season. He finished with a .388 batting average, 22 runs, 38 RBIs, five doubles, a triple and a home run as a junior in 2018. Diaz was named first-team all-area and first-team all-conference last season with the Bearcats. He was also named the 2019 Top Prospect at the Perfect Game National West Showcase and is the No. 39 prospect in Indiana, according to Perfect Game. Peters will add his name to a long list of Northern Illinois players who have competed for the Oilmen. The right-handed hitting freshman was a three-year letter winner at Mount Carmel and hit .305 in 36 games as a junior for a Caravan team that went 26-10. He has appeared in 15 games and made 10 starts thus far at Northern Illinois. Laux has appeared in 13 games and made one start at Prairie View A&M this season. He comes back to the Oilmen after pitching for the team during the 2017 campaign, when he logged 20 innings and compiled a 4.95 ERA. Laux had a 2-1 record with one save while pitching in six games and making one start. Laux will continue his career at Kirkwood Community College following his senior season at Brother Rice. He was a member of the Chicago White Sox ACE program. Pulido is set to continue his baseball career at South Suburban College next season after rounding out his prep tenure at Griffith, where he plays for Whiting native and longtime Oil City Stadium frequenter Brian Jennings. Pulido hit .418 with 26 RBIs as a junior last season. The freshman has made two appearances in his first season at Carson-Newman. The freshman southpaw continues a long tradition of South Suburban players competing for the Oilmen. He plays for longtime head coach Steve Ruzich. A switch-hitting catcher, Berenda has played in 23 games and made 16 starts as a freshman for the Grenadiers.